Voici le programme et le bulletin d’inscription pour la venue de Rinpoche en Novembre. I am happy to inform you that the dates for the Bodhgaya Phowa course has been fixed from December 25 to January 3, 2011. Travel information to Bodhgaya can be downloaded here. We do not have the current course schedule yet but you can download the 2009 version. It will provide you with and idea of what happens when. Download the BODHGAYA 2010 PHOWA SCHEDULE. Download a poster in Chinese relating to the 2009 Bodhgaya Phowa course. 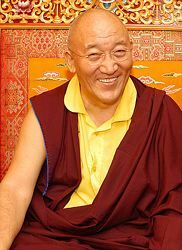 His Eminence Chöje Ayang Rinpoche’s teaching schedule for the US, Canada and Mexico in 2010 can be viewed using your web browser. Click here to view. For more detailed information please visit the Amitabha Foundation Los Angeles, New York or the Vancouver websites.